One of my roommates made this dish back in the day in Philly and I finally made it for S, after mentioning it a few times. It’s a simple but tasty dish, and involves relatively few ingredients. Boil some water to cook the pasta. In a separate pan, heat some butter, add the onions and garlic, and saute until slightly browned. Add the white wine, and cook until reduced to about half. Add the clam juice from the canned clams (reserving the clams themselves) and the bottle, and the parsley, basil, oregano and red pepper (and celery, if desired). Reduce the heat and simmer on low heat for about 10 minutes. Add the reserved clams to the pan, along with the just-before-al-dente pasta, and mix. Add salt and black pepper to taste. Serve with Parmesan cheese. I had also added some “Creole seasoning” and seasoned salt, but next time I will leave out the Creole seasoning entirely and go easier on the seasoned salt, because I like it better when the dish is lighter. I will also go easier on the oil and/or butter next time, but perhaps substitute bacon or pancetta instead, for a richer taste. I might also try making it with a little bit of diced tomatoes. Sunday, July 31, 2011: Served with some lightly-cooked rainbow chard and a 2009 Sauvignon Blanc from St. Supery. 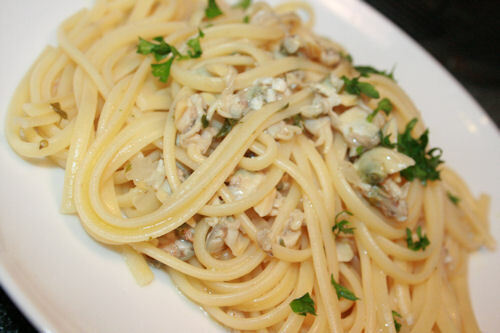 This entry was posted in Italian, Main Dish, Recipes and tagged Clam, Linguine, pasta. Bookmark the permalink.